What happens beyond our lifetimes is not known. We do have the ability, however, to leave with those who follow us a story of what has touched us importantly. Because people have acted upon this ability at Round Top Festival Institute, you see what can be built. The buildings are not the only thing, of course. They are the framework that provides nurturing space for arts and humanities programs that improve our lives and make us better people. Now our need is to secure this wonderful investment for the future, by building our endowment and other investment initiatives that will keep the Institute flourishing for generations to come. Many hands and hearts have helped to develop this cultural center into the unique, enriching place that it is. It matters that we secure this legacy for the future. Too many have worked too hard for that not to happen. Round Top Festival Institute's origin is in music. Johann Sebastian Bach said, "The aim and final end of all music should be none other than the glory of God and the refreshment of the soul." Victor Hugo felt, "Music expresses that which cannot be put into words and that which cannot remain silent." Aldous Huxley's view was, "After silence, that which comes nearest to expressing the inexpressible is music." One man was religious, one man a freethinker, and the third, a humanist. All shared an awe of the power of music. A host of you have been a supportive, committed family of friends, creating deep roots here like the ones William Johnson and Susan Barnes describe in the Planned Giving Guide. As our dear friend Bill Hilgers says in his letter, we have been fortunate in our work, reaching out from Round Top, Texas across America and around the globe to plant musicians who have trained here with acclaimed faculty as part of their preparation for professional careers. To assure that the work that so many have generously invested in continues well beyond our life-times, we ask those of you who might have an interest to consider a legacy gift to Round Top Festival Institute. It can be surprisingly simple to make an estate gift. Philanthropists are often people with wonderful resources. Yet, all of us, no matter what our means, have the opportunity to practice philanthropy as we express what has moved us deeply in our journeys in ways that are appropriate to our particular financial resources. 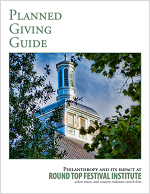 Click here to view the downloadable and printable Planned Giving Guide, which we hope will provide information that will launch thinking about the significant partnerships that can secure a strong future for Round Top Festival Institute. For more information, call the Institute office at 979-249-3129 or email info@festivalhill.org. Thank you for considering Round Top Festival Institute as part of your enduring philanthropic legacy.